Your baby's early child development stages are mostly characterized by uncontrollable and involuntary movements. For about the first 6 months of your baby's life, the child development milestones she will reach consist of a wide variety of reflexes that are part of her innate survival and protective instincts. Failure for any of these reflexes to fully develop has major negative implications for future motor development. After they are functioning, the child's perceptual-motor, physical fitness, motor fitness, and motor skill development occurs. You can never start too early playing with your baby! Check out these fun baby games to play with your infant. The following reflexes appear at birth and then disappear at various stages within the first year. The period of time within the parentheses is the age at which that particular behavior stops. Sucking reflex (up to 9 months) – Involuntary puckering of the baby's lips in response to anything that touches them. Rooting reflex (up to 9 months) – A light touch on the cheek causes the infant to turn his head toward the touch in search of food. Moro reflex (up to 3 months) – When a newborn is startled or begins to fall, her arms and legs extend outward with her hands open and fingers spread. Palmar grasp reflex (up to 4 months) – When something touches the baby's palm, the fingers (not the thumb) reflexively close to grasp the object. Tonic neck reflex (up to 5 months) – If the baby's neck is turned to the side or falls forward or backward, his arms and legs either flex or extend in response to the movement. Babkin reflex (up to 3 months) – Applying pressure to both of the baby's palms at the same time will cause her to do one or all of the following – open her mouth, close her eyes, flex her neck, or tilt her head forward. Babinski reflex (up to 4 months) – Applying pressure to the sole of the infant's foot causes the foot to fan out and the toes to extend. Crawling reflex (up to 4 months) – If the baby is lying on his stomach and pressure is applied to the sole of one of his feet or both feet alternately, he will begin to crawl reflexively by moving his arms and legs. Following is a list of ages and stages of child development for the rest of the baby's first year. The baby begins to show some voluntary movements, but you'll see that other reflexive behaviors continue to show up before disappearing by the end of the first year. Please keep in mind that these developmental milestones are only general guidelines for what actions you might expect to see your baby perform. Every child is unique, and they all grow and mature at slightly different paces. Stepping reflex (up to 4 months) – When a baby is held upright with her feet touching a flat surface, the pressure she feels on the bottom of her feet will cause her to respond with crude walking-like movements. Swimming reflex (up to 4 months) – When an infant is held horizontally in the water with his head up or over the surface, he responds by moving his arms and legs rhythmically in a swimming-type motion. Head and body righting reflex (up to 6 months) – If the baby's head is turned to one side while the baby is on her back, she will roll her body in the same direction. Likewise, if her body is rolled to one side, the baby will turn her head in the same direction to follow her body. 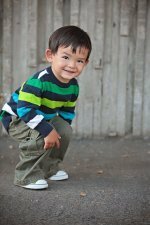 Labyrinthine righting reflex (up to 12 months) – If an infant is held in an upright position and then tilted in some direction, the baby responds by moving his head in the opposite direction of his body in an attempt to maintain an upright posture of his head. Plantar grasp reflex (up to 12 months) – Stroking the baby's toes will cause him to flex his toes like he's trying to grasp an object. Pull-up reflex (up to 12 months) – If an infant is put in an upright sitting position and tipped either backward or forward while holding her hands, she will respond by flexing or extending her arms in an effort to maintain an upright posture. 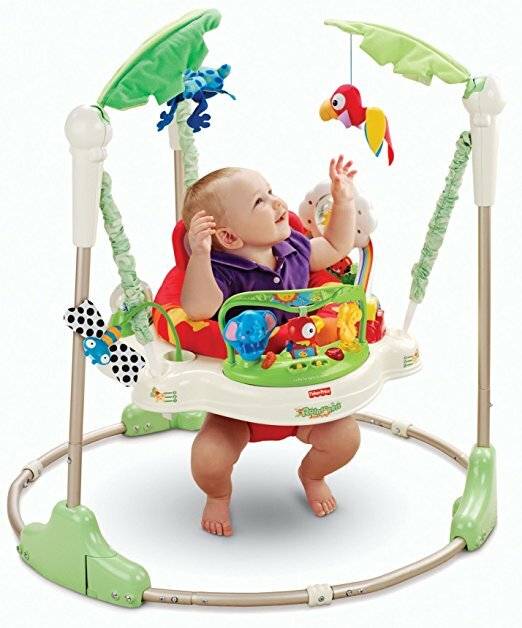 Parachute reflex (up to 12 months) – When an infant is held in an upright position and then tilted toward the ground, she will extend her arms and legs reflexively in a protective movement to break the fall. If she's quickly lowered downward while in an upright position, she’ll extend and spread her legs and rotate feet outward to brace for landing. Startle reflex – When an infant is startled or begins to fall, his first reaction is to flex his arms and legs. Worried or have concerns about your child's development? Check out the CDC Developmental Milestones page for helpful videos and information.